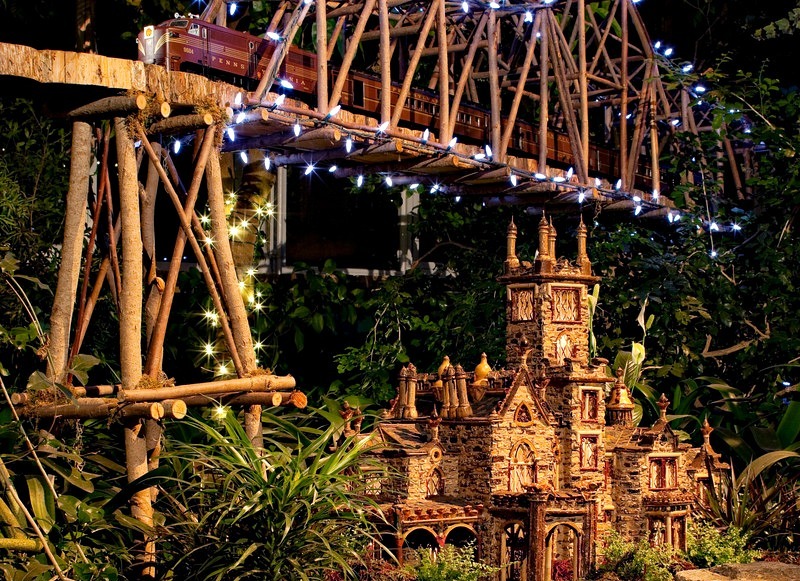 Every year, the New York Botanical Garden‘s Holiday Train Show gives visitors the chance to marvel at iconic New York landmarks and model trains. 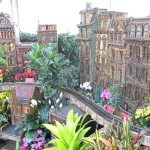 Now in its 23rd year, the show features more than 20 locomotives traveling on almost a quarter mile of tracks, which are laid out amongst the Metropolitan Museum of Art, Radio City Music Hall, and more than 150 other replicas made from bark, pine cones, pistachio shells, and other plant materials. Like any train, the Holiday Train Show requires a team of conductors to guide it, and Karen Daubmann is on board as the Associate Vice President of Exhibitions and Public Engagement, responsible for overseeing a wide range of current and future exhibitions. For this show, Karen works closely with Applied Imagination, the visionaries and builders behind these structures, to ensure the show runs smoothly and on time. We recently visited the show and spoke with Karen–standing near the Brooklyn Bridge and Yankee Stadium–to learn more about this annual production. What does your job as Associate Vice President of Exhibitions and Public Engagement entail? 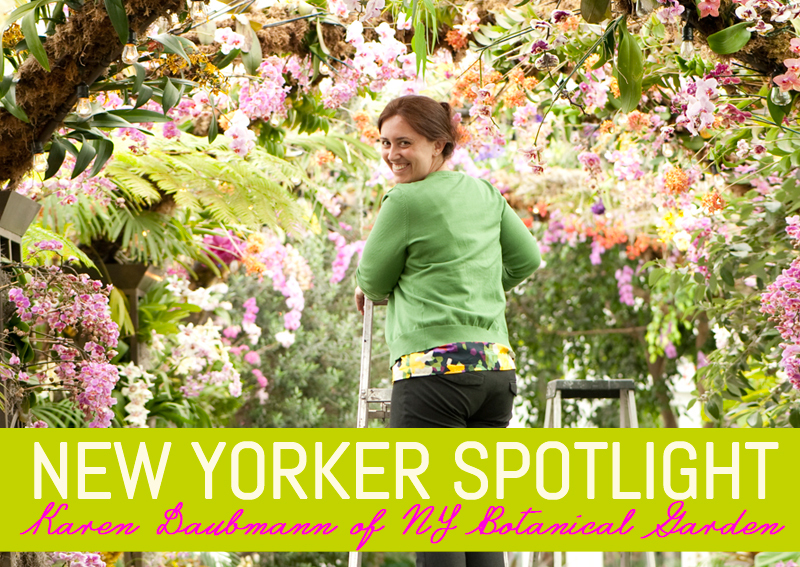 Karen: It’s a huge job here at the Garden. It encompasses planning for the future and also implementing exhibitions, gallery spaces and flower shows throughout the year. I am not only working to install or de-install the Holiday Train Show or build the orchid show, but I’m also about five years out on contracts, securing artists and working on themes for future exhibitions. 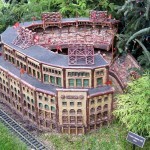 For the Holiday Train Show, what are your responsibilities? Karen: Each year, I build a contract with Applied Imagination. In January, we talk about and plan for the coming year. There are a lot of man hours involved with building each of the structures, and some years we do a few new buildings or rent new buildings from them. We’re actually talking about a pretty big expansion in the future. Can you share a bit about Applied Imagination’s incredible work? 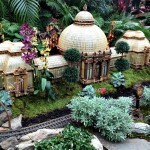 Karen: Applied Imagination has been with the Holiday Train Show for 23 years. 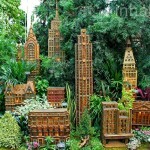 They are great, and their focus is creating little buildings out of plant parts. Since we’ve worked with them, they’ve gone on to do a lot of other museums and cultural institutions, specifically botanical gardens. Our colleagues from other gardens come here and check this out. They say, “We should do this too.” Typically, winter is a pretty hard time at a botanical garden. You’re worried if people will come with the weather. Having an exhibition like this brings people out; it’s been really good for us. Does Applied Imagination ever amaze you with their creations? Karen: Absolutely. Right over there is the Enid A. Haupt Conservatory. Originally, we had a conservatory that was built in the ’80s. Over the years, the conservatory had taken a beating from traveling for promotional purposes, as well as with yearly installation and de-installation. We knew we wanted to repair the building. Applied Imagination decided to build a brand new conservatory from scratch. They didn’t tell me until they took it out of the box. They also redid Grand Central Terminal. It’s interesting too because when you look through the show, you can sort of tell which of the buildings are a little bit older and those that are newer. Applied Imagination has really grown in their artistic representation of the architecture. The older buildings are charming, but the newer structures are very precise. They have really mastered the materials. 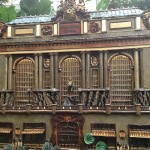 The buildings are made with parts like pistachio shells and cinnamon sticks. What are some of the other plants found throughout the show? Karen: A lot of the plants are common houseplants; low-light plants that are really good for this time of year include spider plants, echeverias, Norfork Island Pines, and orchids with some kalanchoe mixed in. Applied Imagination is based in Tennessee, so they are at the mercy of local growers. They have a lot of ideas about what they would like to use, and on the second or third day of the installation they go tag plants, which are delivered the next morning. It’s interesting to see the combinations start to appear as the installation progresses. Karen: Applied Imagination has gotten it down to a science. It takes basically a week with a team of about 20 people. They will have a crew in our warehouse that is prepping the buildings, dusting them off, gluing anything that is lose, adding new plant parts, and then they ship them up here. There is another crew that lays the tracks and the power. They load in a lot of our mulch, mosses, and plants. It comes together quite quickly. 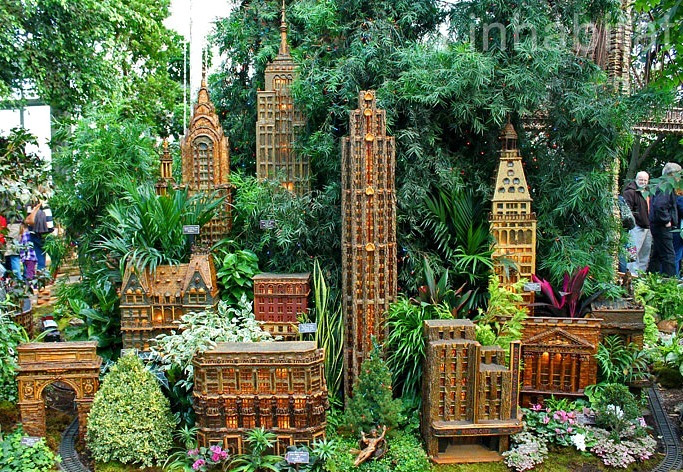 Why do you think visitors are so excited to see replicas of iconic New York landmarks? Karen: As children, we grow up with dollhouses and train sets. We like the scale that makes us feel larger than life. I think it’s really cool to point out some of the plant parts like cinnamon sticks, acorn pots, and pistachio shells– things that they are used to seeing, but not in this context. It makes people pause and consider things a little bit differently. Karen: It’s a really nice multi-generational hobby. I think everyone likes the movement and the sounds. There’s something about the holidays and trains that brings up memories of receiving train sets as presents or trains going around Christmas trees. Then when you do it on a scale like this, it’s really amazing for our visitors. 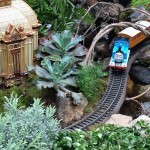 How does the Garden go about introducing new trains and trolleys? Karen: In the beginning of the show, there were very few trains. When I started here, there were 12 or 13 trains. Last year we added three new trains. 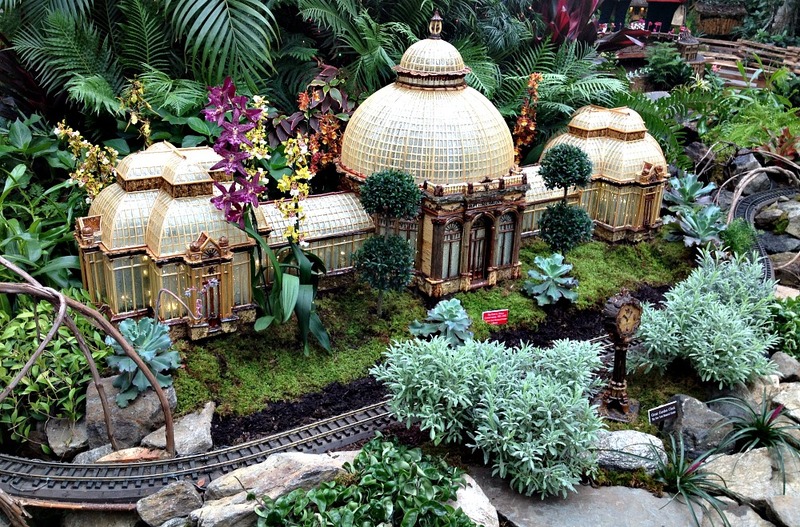 We also added the vignette that is in the Palm Court that has two trains on it. We like to shout out to our friends at Metro-North, so we have a special Metro-North train. We like to promote that partnership and talk about how it’s only 19 minutes by train from Grand Central to our station across the street. How long has Thomas the Tank Engine been part of the show? Karen: Thomas has probably been part of the show for five years. 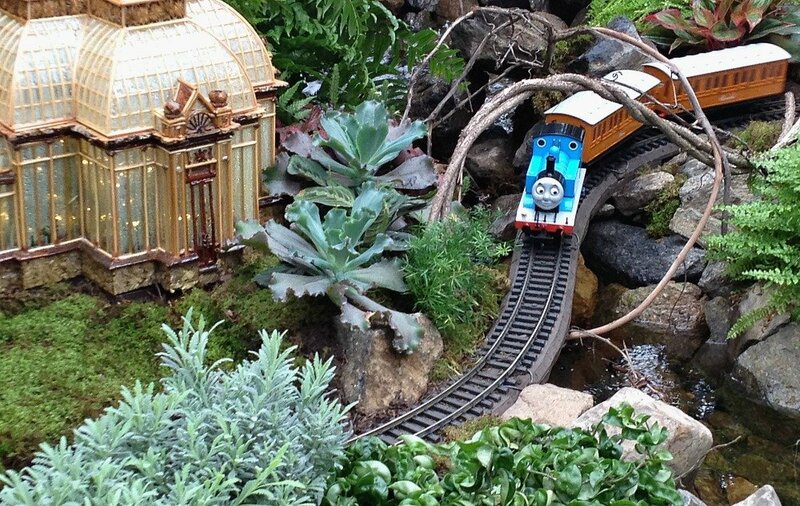 We worked with the Little Engine that Could for quite a long time, and then Thomas kept gaining in popularity. You can’t have a train show and not have Thomas. In January, we have Thomas come and do a stage performance. It’s really sweet, and the kids get to meet Thomas and the conductors. 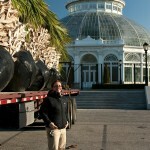 In addition to Grand Central Terminal and the Enid A. Haupt Conservatory, what else is new this year? Although not new, it’s always a surprise to see where the buildings are going to wind up, and how they are going to be grouped together. Throughout the eight years that I’ve been here, I’ve looked at the buildings a million times, but the next year when a building is placed next to a different building or there is a different plant behind it, you notice different details because of the context. What do you hope visitors discover about the show, and more generally the Garden, when they visit? Karen: It’s one of our visitors’ favorite exhibitions, and it’s one of the ways new visitors come and find out more about the Garden. 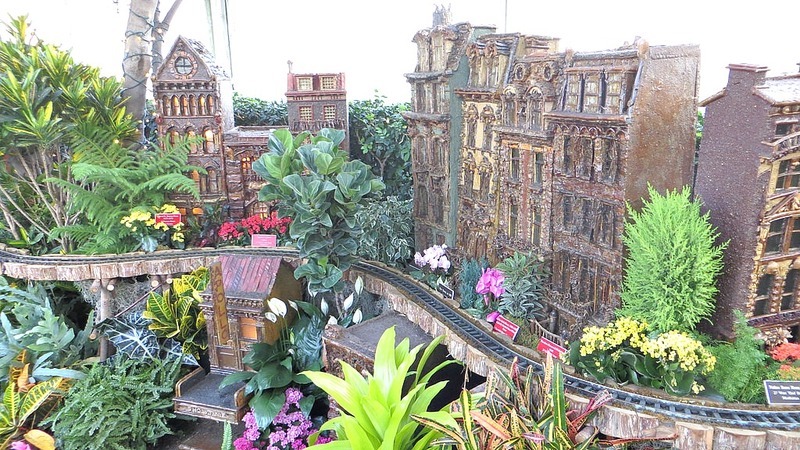 Our frequent visitors are always wowed that the Holiday Train Show is in the exact same spot where all of our flower shows are. They are wowed by the feats that it takes to change the entire look of the space. This is where Monet’s Garden was; there was a Japanese footbridge right over there and his house was down there. This is the same spot where we had Emily Dickinson’s Garden, and the Gardens of the Alhambra. Our orchid show is here every year. It’s the same place where Frida Kahlo’s Garden will be in May. New visitors are in awe of this whimsical show that they may have heard of, but [couldn’t imagine]. We encourage them to go into the conservatory to see the exhibitions. I love it when visitors venture out into the 250 acres. They don’t feel like they are in the Bronx. For some, it might have been a long time since they’ve seen a 50-acre forest that they can hike through or view really beautiful rock formations with the Bronx River running through it. Do you think there is anything special about the Garden in December and January? Karen: It’s different. People really love magnolias, azaleas, or the spring color, but the Garden is gorgeous throughout the year, especially if there is snow. We have beautiful conifers, evergreen collections, and the trees are amazing. To be able to get out and about, get fresh air, and take a nice walk is of value. 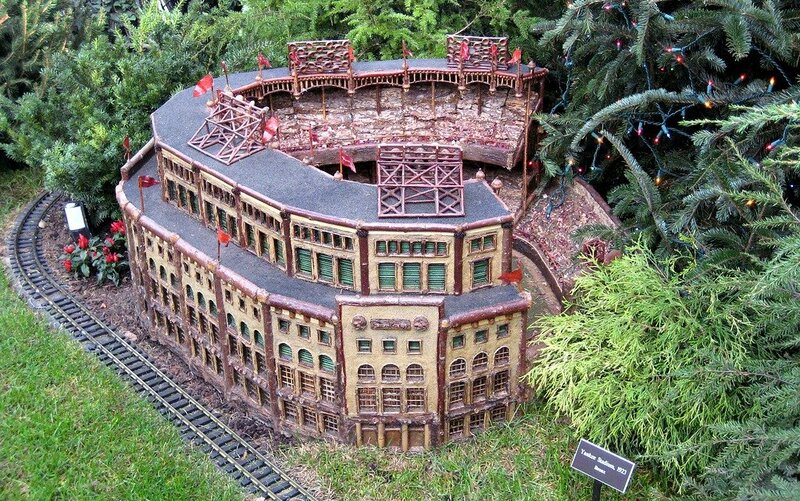 What does it mean to give New Yorkers exhibits like the Holiday Train Show? Karen: Growing up, I didn’t really know what I wanted to do with my life. I never knew that professions like this existed. I love that what we do changes so frequently. I love that it’s never stale or static. I like to walk through the show and listen to people’s comments and hear their amazement or listen for something we could change for the coming weeks or the next year. 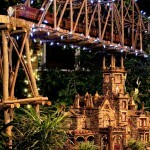 The Holiday Train Show runs through January 19, 2015. On December 19, 20 and January 2, 3, 9, 10 from 7-10pm, the New York Botanical Garden offers Bar Car Nights in conjunction with the show. More information is available here.